Thanks for your interest in the free iPad & iPhone applications. These apps will help you immediately – and easily – enjoy all of your favorite Daily Reckoning content right on your iPad or iPhone. See the instructions below for installation. Click here to go to the iTunes store on your desktop or laptop computer. 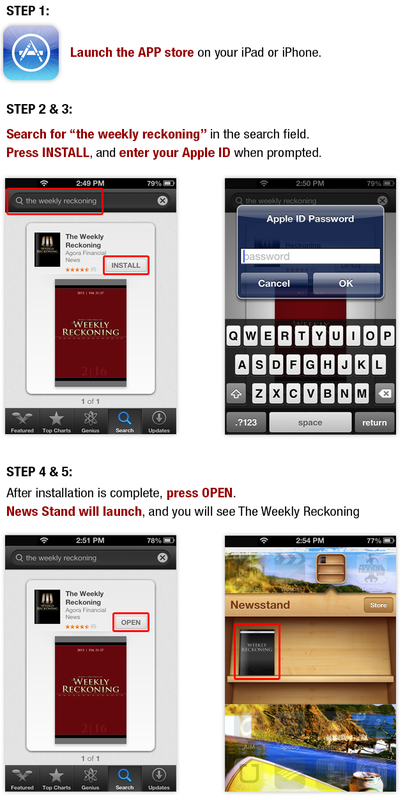 Sync your iPad and computer to load the “Weekly Reckoning” app onto your iPad. Open your iTunes program on your desktop or laptop computer. Click on the “iTunes Store” button in the left margin of the iTunes program screen. Once you get to the store, click on the “App Store” button along the top edge of the iTunes Store. The App Store lets you browse applications and download them directly to your iPhone. Go to the search box in the top right corner of iTunes and type in “Weekly Reckoning” Select your free iPad app and download it to your computer, and then sync it onto your iPad.